With all of the crafting that I set my sights on, a lot can tend to fall by the wayside. I learned to knit last year and went on a rampage... until the weather started to warm up. This has left me with quite a few knitting projects. One in particular has been nagging me: a scarf for my husband. He likes to wander around the house saying 'woe is me' to all of the projects I'm putting together for myself, my dancing or others, yet aside for some fingerless gloves, he isn't the recipient of many. I promised him that I would make him a scarf... last November... as it has now been a year since I started, I think it's time to finish it. Maybe in time for his birthday at the end of the month? We'll see. Just in time, Fia Lotta Jansson blog has come to the rescue! Sofie has posted a blog challenge to finish your knitting projects. I have a few I'd like to enlist, but for now, I'm going to stick with his scarf. 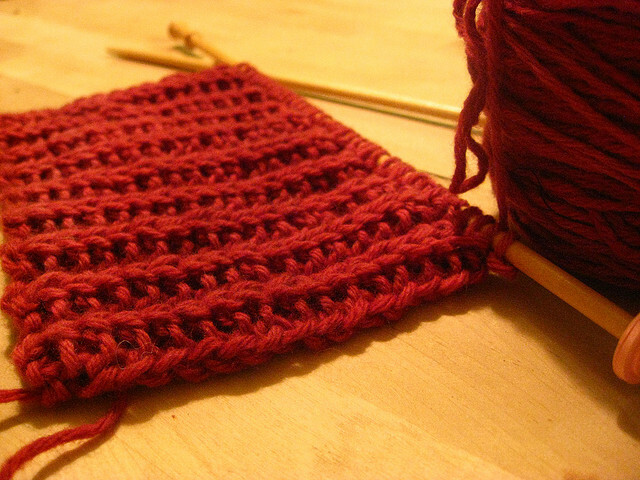 Here's a picture of the scarf in progress. I'd say I'm currently about 20% done (it's now a bit longer than the picture, but still a ways away). It's a super easy knit, and a pattern I've done before, but if you get distracted it can be easy to do a weird repeat in the pattern, thus making you tink back to your mistake. I will not let this scarf get the best of me! Thank you for signing up! It is a great gift for your husband! What's been keeping me busy? Aren’t you plaid to see me?